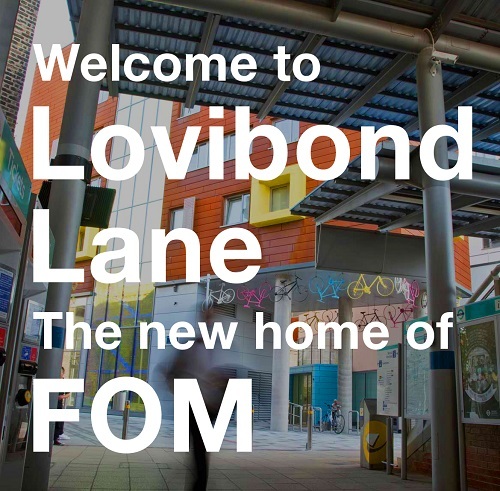 FOM will soon be moving to new premises at 2 Lovibond Lane, London SE10 9FY. It’s a stone’s throw from Greenwich station which will make getting to us a cinch, especially from 2018 onward when a number of infrastructure upgrades to London’s transport network will be completed. The new premises house the FOM office and the newly created Education Centre for Occupational Health (ECOH). Lovibond Lane is a 2 minute walk from Greenwich station where DLR and Southeastern Main Line services stop. In 2018, the new Crossrail Elizabeth Line opens. 2018 also sees the opening of the rebuilt London Bridge station (Jubilee and Northern lines). These events offer very fast transport links to FOM and the ECOH. Victoria to Cannon Street (Circle or District lines) 13 minutes, Cannon Street to Greenwich (Southeastern Main Line services) 12 minutes. At present, Greenwich trains are not stopping at London Bridge. This will change when the station reopens in 2018. Travelling from Waterloo, it will be quickest to take the tube to Cannon Street via Embankment (Bakerloo, then District or Circle lines) 10 minutes, then take Southeastern Main Line services to Greenwich. Once London Bridge reopens in 2018 it will take 4 minutes to travel from Waterloo to London Bridge (Jubilee line) and a further 8 minutes from London Bridge to Greenwich on Southeastern Main Line services. When the Crossrail Elizabeth Line opens, there will be fast options from Paddington, King’s Cross, Farringdon and Liverpool Street. All these stations reach Canary Wharf quickly. Greenwich is a 10 minute journey from Canary Wharf on the DLR. King’s Cross is a 2 minute journey to Farringdon on the Circle, Hammersmith & City or Metropolitan lines. And remember, it’s just 10 minutes from Canary Wharf to Greenwich on the DLR. For more information on the best route to take from your preferred London station to Lovibond Lane, please see the Transport for London journey planner. There are four ‘chain’ hotels within a 5 minute walk, including very reasonably priced rooms. There are further B&Bs and hotels within a 10 minute walk.